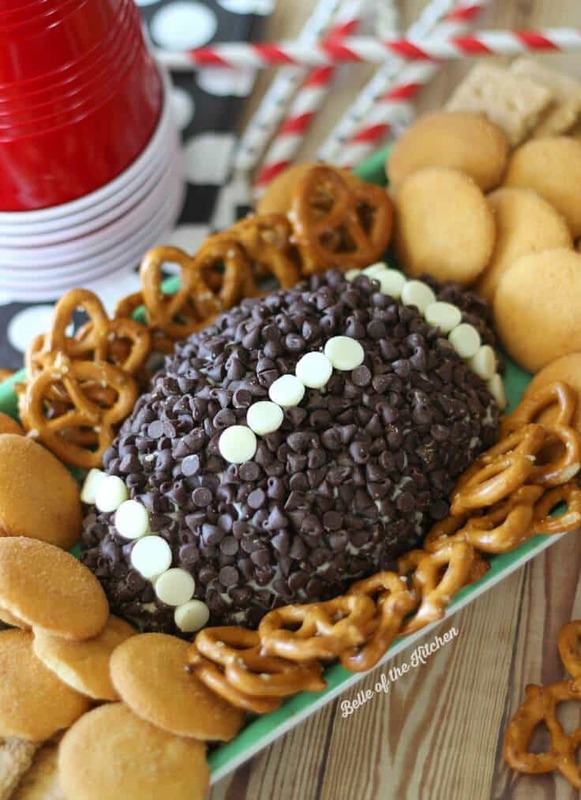 Impress your guests with this Game Day Chocolate Chip Cheesecake Ball. It’s a perfect way to satisfy your sweet tooth while cheering on your favorite team! Hi everyone! I’m Ashlyn from Belle of the Kitchen. I’m excited to be posting here today for the first installment of “Ideas for the Kitchen,” a new recipe exchange series that Carrie and I are bringing to you! Once a month, Carrie and I will swap blogs and exchange recipes to give all of our lovely readers something new and delicious to try at home. 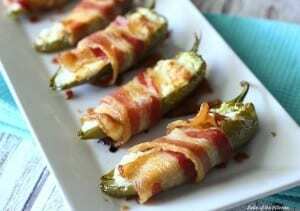 Today we are highlighting appetizers in honor of football season; the most wonderful time of the year, if you ask me. 😉 So get ready for snackin’, because I have a Game Day Chocolate Chip Cheesecake Ball to share with you! You can find Carrie over at Belle of the Kitchen today with her recipe for Easy Cheesy Green Pepper Dip. Since fall is finally here and football season is underway, I decided to bring a little game day fun to Kenarry. Traditional cheese balls are always pretty popular for get-togethers and parties, and I always look forward to snacking on them. But who says cheese balls always have to be savory? I mean, why not have your cheese ball for dessert? And so I give you this delicious Chocolate Chip Cheesecake Ball! AND, I’ve made it into an extra special football shape so it’s just right for enjoying during your next tailgate party! Making this cheesecake ball is a fairly simple process. A few years ago, my mom gave me this super cute football platter set for Christmas. I love pulling it out this time of year and using it to serve different types of salsa while we watch the game. When I decided to make a football shaped cheesecake ball, I knew one of the bowls would work perfectly! 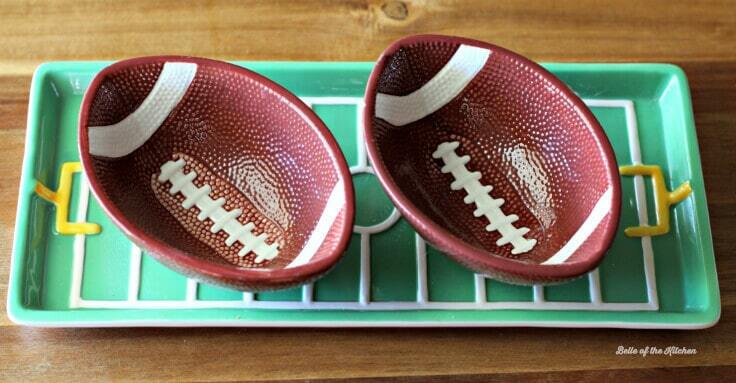 Now there is no need to worry if you don’t have a football shaped bowl like this. If you have a small, oval shaped bowl, you could use it in the same way. Or, you could simply shape the cheesecake ball using your hands once it has properly chilled, as it is very easy to manipulate. To get started, mix up the cheesecake ball ingredients, then cover and chill in the fridge for about two hours. 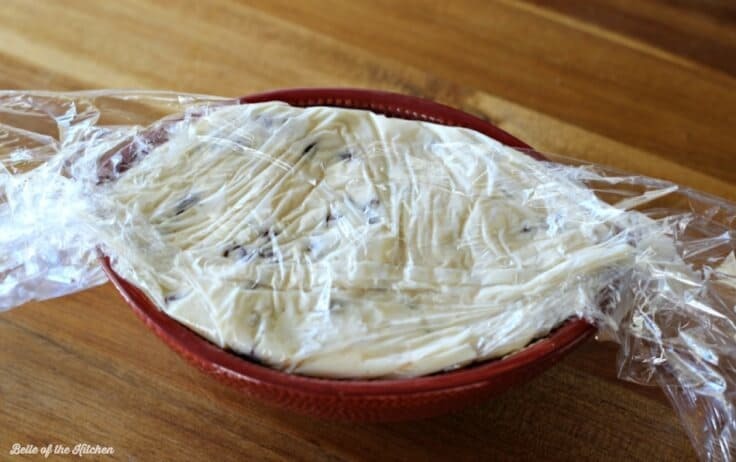 If you plan to use a bowl for shaping your cheesecake ball, line the inside of the bowl with plastic wrap. Fill with the chilled batter then cover and return to fridge to chill for one more hour. If you are making the football shape by hand, use a large piece of plastic wrap to help form into a football shape first. Once the cheesecake ball is finished chilling, transfer to a serving plate. To do this, I unwrapped the top of the cheesecake ball, then flipped it over on top of the platter. Next, I carefully pulled back the plastic wrap to loosen it from the bowl, then finished removing all of the plastic wrap. At this point, it was ready for decorating! 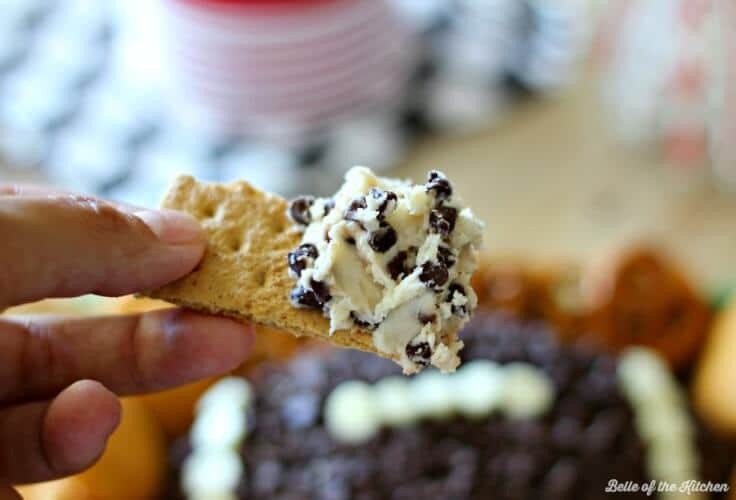 I covered mine in miniature chocolate chips, then used white chocolate chips for the accent color and “laces.” I love serving this with graham crackers, vanilla wafers, and even pretzels for that yummy sweet and salty combo. Actually, pretzels are my favorite way to scoop and eat this yummy cheesecake ball! So tell me, are you a football fan? College football, NFL…maybe both? My husband and I are both big football fans, though we do live in a “house divided.” I’m a Georgia fan and my hubby is an Auburn fan, but we do both cheer on the Atlanta Falcons! 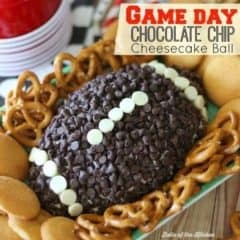 I hope that this Chocolate Chip Cheesecake Ball makes your game time a little bit more fun, whether you’re busy cheering on your team, or simply enjoying the food. Have a great week, friends! Beat cream cheese, butter, and vanilla in a medium sized bowl until fluffy. Add sugar and beat until combined. Stir in 3/4 cup mini chocolate chips. Cover and refrigerate for two hours. 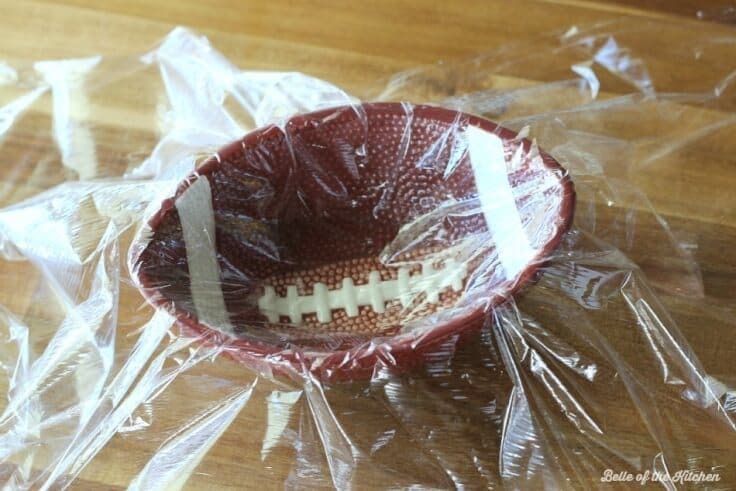 If making a football shaped cheesecake ball, line the inside of the bowl of your choice with plastic wrap then fill with mixture. Cover the top with plastic wrap. If you are not using a bowl, simply place the mixture on a large piece of plastic wrap and shape into a ball. Refrigerate for a least an hour. To decorate and serve, remove plastic wrap from the top of bowl and invert cheesecake ball onto serving platter. Remove remaining plastic wrap. If you are not using a bowl, remove plastic wrap and serve as a ball, or use your hands to make into football shape. Decorate by covering cheesecake ball with remaining mini chocolate chips. To add accents to resemble “football laces”, add in white chocolate chips to the center and top sides. Serve with graham crackers, vanilla wafers, and pretzels. Thank you so much to Carrie for letting me come visit and share my Game Day Chocolate Chip Cheesecake Ball here on Kenarry! I’m looking forward to coming back next month to share more Ideas for the Kitchen with all of you! Love cheesecake want even more dessert ideas? Check out a few of these recipes? Originally published October 2014. Updated October 2018. Ashlyn is the recipe developer, writer, and photographer at Belle of the Kitchen. She's the mama of three precious babies, an army wife, and southern girl at heart. She and her family are currently stationed in Texas, so when she's not making a mess of the kitchen, she and her little ones are outside soaking up the sunshine. She loves to share a balance of healthy recipes, family friendly meals, and plenty of treats to satisfy your sweet tooth. Ashlyn was part of the Creative Team on Ideas for the Home by Kenarry™ from the Fall of 2014 until May 2016. You can connect with Ashlyn on Facebook, Pinterest, Twitter, and Instagram to keep up with the new recipes coming from her kitchen. What a fun (and delicious!) idea! I love that you teamed up with Ashlyn…she is one of my favorite food bloggers! I’ll be sharing this on Facebook later today! Ashlyn’s one of my favorites too! Thank you so much for sharing, Michelle. I really appreciate it! this looks so yummy!! 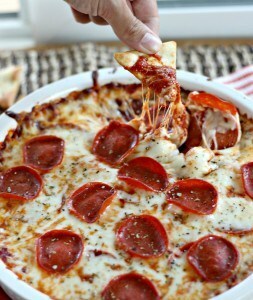 I love a good cheese dip and a sweet version is amazing.. pinned it and shared to my FB! Aww, thanks Emily! Didn’t Ashlyn at Belle of the Kitchen do an incredible job with this recipe. I love how she make it football shaped too. Thank you so much for sharing on Pinterest and Facebook. We really appreciate it. You are a genius. This is so beautiful and tasty. Thanks for sharing. Thanks, Divya! Ashlyn at Belle of the Kitchen had such a great idea, didn’t she?